On the last day of the last year we drove 4 hours from Green River, WY to the Jackson Hole area. Of course we had to stop en route at the Wind River Brewing Co. in Pinedale where Doug had to sample their darkest brews to figure out which one we should take to go in a growler. After we gorged ourselves on their famous reuben and bison burger – and incredible fries – we decided on the Out of Order Porter but were equally impressed with the Buckin’ Bitter. The sips I had of the others were pretty darn good too! So as I said, after Doug handed me the keys to Ellie (hiccup! 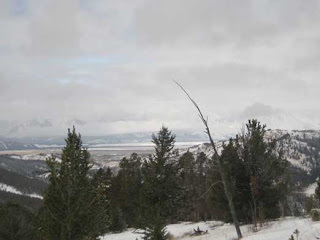 ), we continued toward the Jackson Hole area where we loaded up on groceries at Jackson Whole Grocer. 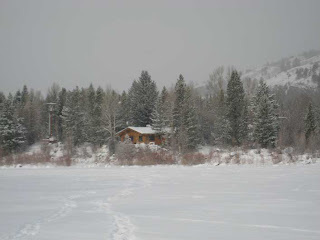 Then we drove northeast past the Elk Refuge to Kelly, WY where we exchanged money for keys to our cabin on Slide Lake. 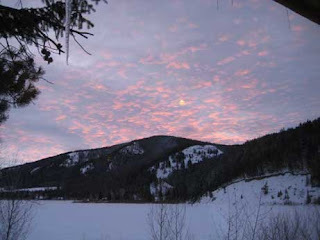 The Budge family operate a group of cabins on this lake, called Slide Lake because of the massive landslide that formed it in 1925. On May 18, 1927, however, after heavy rains and snow melt, the natural dam burst and the town of Kelly was largely swept away. Six people also died. According to the cabin’s caretaker, Art, a man everyone dismissed as a ‘mad trapper’ had warned the town of this impending doom. Hard to know which prophets to believe, eh? While we didn’t experience that kind of massive natural occurrence, the roads on the way in were pretty icy and I managed to slide off into a tree at about 10 miles per hour. The good news is no one was hurt, Ellie is fine other than a small catch in the passenger door when it’s opened, and if we’d been stuck we’d have had food for a week, sleeping bags, and could have sent Riker out for help with a note tucked into his collar. Also, at that exact moment a couple of other cars happened upon us and a good samaritan from Utah helped to push us back on the road while his wife stood there snapping photos. Thanks, lady! When we first arrived we were afraid we wouldn’t have enough snow for our snowshoeing plans, but mother nature quickly obliged with three solid days of light powder. The lake was frozen enough to support us (and the annoying skidoos that buzzed up and down it) and there was plenty of backcountry to explore. So we did. Where no skidoo dared follow. The first couple of days we took it easy, getting used to snowshoeing again after a couple of years off. I swear there are muscles you only use while engaging in this particular sport! 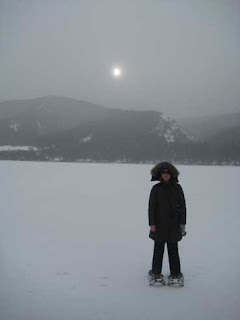 By Sunday, our last full day there, we were ready for a major expedition. 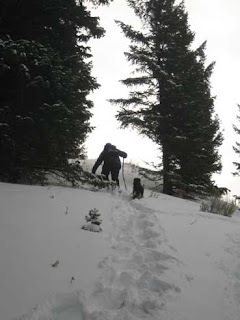 Loading up our packs with chicken soup, hot chocolate and lots of snacks for us and the dog, we headed out. As you can see, we also headed up. Way up. According to Doug’s GPS we climbed 1,553 feet in loose powder. If you’ve never done it before, think of dragging 10-lb ball-and-chains up a surface where you slide back with every step you take. Pretty exhausting! But with our make-shift walking sticks in hand (we pillaged them from the dead wood lying around) and frequent breaks we made it up to a gorgeous view of the snow-capped Tetons shrouded in clouds. We kept going up for a while after this because the GPS indicated the summit was “only” about another 900ft elevation gain over a 1/3 of a mile. What it failed to indicate, though, was that this route went straight through a multitude of downed trees = major tripping hazards when your feet are the size of large baking dishes. So we decided we’d reached our own personal summit and found a log to perch on while we slurped down our soup. Of course the last bit was the trickiest, with close underbrush and downed trees. At the very end I just took off my snowshoes and tossed them down the hill ahead of me, picking my way down in my boots. The last 8-foot drop to the access road was a doosy, but I managed to shimmy partway down a tree and then swing myself off a large branch in true bushwacking style. After our four-hour expedition we were all pretty pooped. 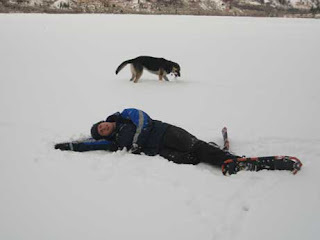 Doug decided to take a catnap on the lake while I figured out the best way to hurl myself down the steep bank to join him. 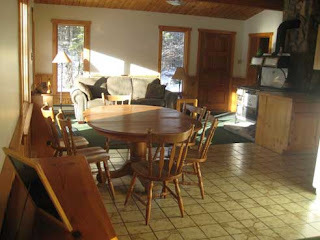 Then back to the warm cabin, a hot shower, a cup of tea, and a cozy couch.